Laurie, your projects are absolutely PERFECT. AWESOME creations! I especially love the Merry Christmas Tree card! Gorgeous cards! I love the Christmas tree! These are all beautiful Laurie. Love the Holly card, that's just my style. Thank you so much for sharing. Beautiful cards! Love all those dies! LOVE your cards, Laurie! So super festive and perfectly CAS!!! 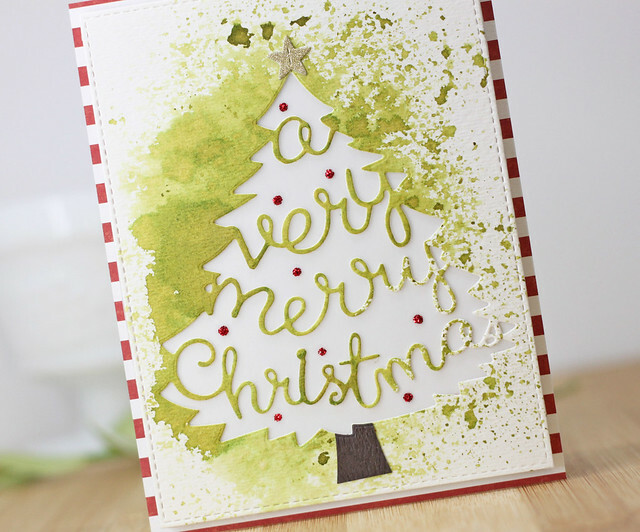 I super love how you watercolored the tree die! Great idea!! The simplicity of these projects is wonderful! Love them all! Such beautiful designs, and I really love the watercolor card! love the little village die! I love your clean simple cards, especially the Christmas tree! Very cute and very pretty cards!! The cards are so bright and happy. Thanks for the inspiration. The Merry Christmas Tree die seems like it has so many possibilities. Thanks for sharing. Simple and Stunning! I love the simplicity of these cards. They are so very pretty. Thank you for sharing. Thanks for showing creative ways to use the new Hero Arts products! Love the olive backgrounds in two of the cards. Your projects are fabulous. The Christmas tree and Neighborhood dies are gorgeous. I really like the simplicity and clean design of card #3. Thanks for the inspiration. Laurie, this is SO pretty! I love tiny buildings, and cities and towns, and you have made this little holiday village beautiful! Thanks for the great ideas! Love all three cards! I love that tree - so fun. The 2nd card is so elegant. And I love how you scored lines to make a frame on the last one. Paper Layering Neighborhood is so beautiful!!!. The die speaks for itself and by adding a pop of color it makes it so lively!!! Awesome cards! Love the neighborhood die! These new dies are unbelievable. Love the Christmass tree. I like the tiny town buildings too. Very pretty and all your cards are clean and beautiful. I really like the neighborhood die with the glitter behind. Looks like all the house lights are shining! Ooohhh, 3 beautiful cards. I'm really liking that tree card, though. Thanks for sharing. Love all your cards and really like the 3rd one with the scored frame..Perfect!!! Lovely cards. I love the new dies, especially the Very Merry Tree. WOW!! totally different spin on the tree die! Love it! I really like your card making style and that Christmas tree due cut is calling my name! Thanks for sharing! It always gets me even more excited about new releases! I like how you used the very merry tree fancy die. Outstanding cards, loving the new Christmas Tree die. Beautiful cards - I love the CAS look of your color layering holly card. I love the CAS! And that Christmas Die is sooooo perfect! Love your cards and how you made them. You made it seem so easy that I know I can do this. Oh what fun it is to make.. a Christmas card right now - with the new release! Such absolutely gorgeous cards! Love the glitter panel you added behind the cityscape...perfect! Hello Laurie, that paper laying village is saying buy me. The color layering holly is my favorite. Nice clean cards! Lovely cards and an awesome die. Wonderful cards. I have an ever-growing wish list! Fabulous cards! Love the first one with the cutout tree! So many awesome new things in this release. I just love your CAS designs, so elegant and timeless. Like how simple and easy your cards are. That is what we need when Christmas comes to town. Great work, lots of goodies on this new release! Beautiful card...love your gorgeous Christmas tree! very classy cards, Laurie - especially love your neighborhood with the gold windows. Your Christmas cards are so pretty! Thanks for all the inspiration with these new products. I love what you've done with the new release! Love that 'neighborhood' die! So beautiful with the gold glimmer behind it! A great new release. Thank you for the inspiration! Just lovely cards. These are simple but beautiful cards. Sometimes less is better. Three gorgeous cards, Laurie! Beautiful watercoloring on the first and I love your CAS designs on the last two! Very pretty cards. I love the fancy Christmas tree die cut. It really makes an elegant card. Thanks for the inspiration. Great cards! The color layering holly is my favorite. Oh, my goodness!!! I love all of these. Love the watercolor "tree" card, the 'neighborhood' die is totally amazing, and the simplicity of the last card is such a visual relief in the middle of a creative hop like this. I have to remember to try that simple embossed frame idea. It's a technique I have known about for a long time, but never seem to remember when I start a card. It really packs a punch. Thank you. Wonderful Christmas cards Laurie!! I love the Holly leaves. Loving the Neighborhood die. Would be cute with a Santa & Reindeer in the sky above. I love the gold behind the village...makes it look like the lights are on. So clever. TFS! Beautiful cards. I love the tree card. Great ideas. Love the tree. These cards are beautiful! I love the neighborhood card which is perfect for mass production as I have to make 50 cards to send out over Christmas! Thank you for sharing your creativity and inspiring us to create! Love the simplicity of your cards--nothing to detract from the focal point. Not all cards need all the bells and whistles--just the simple message of Christmas. Very nice--have a great day! Two of your cards use products I'd like to have. The Neighbourhood die card is classic in the white foreground & the gold glitter in the windows. Lovely. The Fancy Tree Die card is great also. I really like your CAS style. That neighborhood die is super cool. Love the gold glitter in the windows. Really brightens the card. Lovely cards, that ink looks amazing! 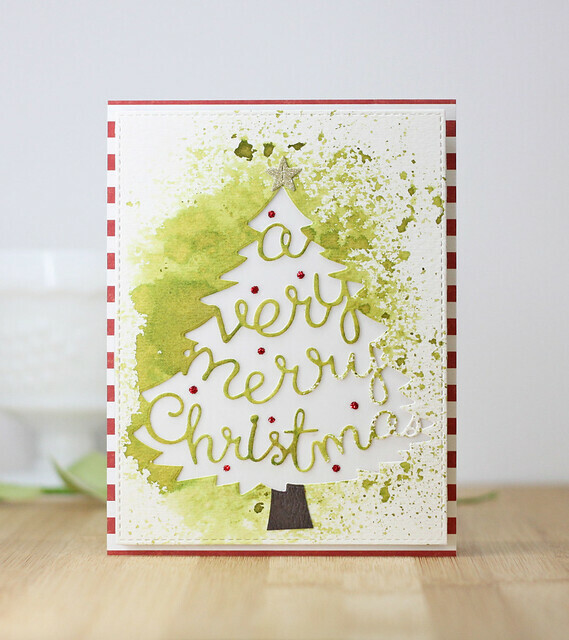 That very merry tree fancy die is so fantastic, just like your cards! Your cards are all terrific but I like the last one the best. Like the scripty sentiment Christmas tree and the pop up houses die. Beautiful cards!! I really love the neighborhood. Love the holly card - so classic! Oh my, I`m loving all three of your beautiful cards featuring the new designs from the Hero Arts holiday catalogue. Beautifully done. I like your abstract Christmas treet with all the bright colours, and the subtle town with the gold backing. I also love and I think this is my favourite the holly card. Beautiful! I love your white neighborhood. I MUST have this die. I love the small town die. Your cards are amazing. I loved the Paper Layering Neighborhood card. Very clllean and simple, yet elegant. Also, this would be easy to mass produce! Fantastic cards! 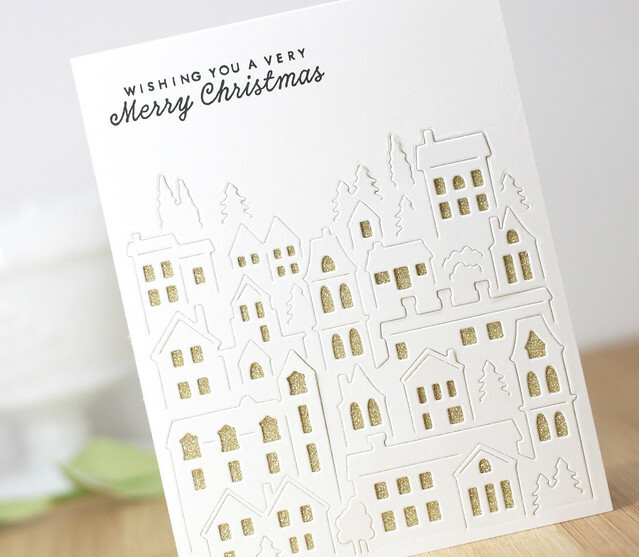 I love the wishing you a merry Christmas card - I love the gold sparkle in the windows! Pretty cards you have created! I love CAS cards, I can do these lol. Thank you for sharing and the inspiration! Gorgeous images youve made, the cas holly is so elegant & the homes are appealing to me the more I see fab cards like yours.Thanks for sharing. By this point in the hop, I have seen the same items used , but your creativity makes them still new and different - everyone looks at the same products with a different eye and their own colors and tools! 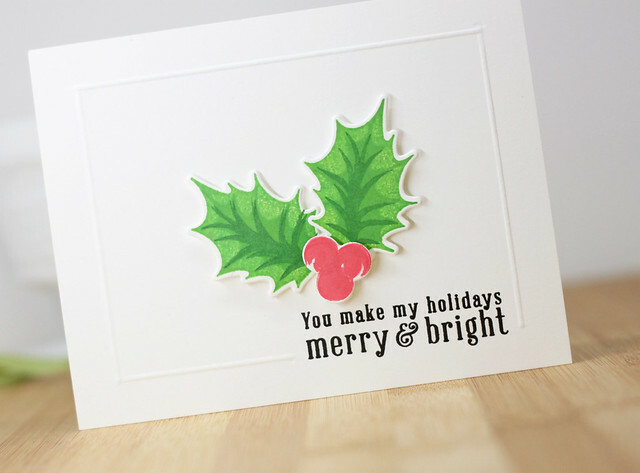 Love these clean and simple holiday cards! Lovely cards--the white on white is just stunning! The tree card is fabulous. Great cards and love that Paper Layering Neighborhood die! Nicely done cards for sure! I love what you did with the golden city! How playful! Thanks for sharing! Lovely ideas! Love the neighborhood die/care; lovely! So many wonderful new products this release. Beautiful and elegant cards! Fabulous cards and such clean designs. Very pretty cards! I love the watercolor look of the first card. Big fan of watercolors. Great cards! I think the first one was my favorite. I love the watercolor background. thanks for sharing. Oh so beautiful! I've only been crafting a couple years and try to send cards every week to whoever I feel needs a pick-me-up. Thank you for the inspiration & chance to win! Great cards, love this inspiration. Thanks for showing us 3 great ways to wish everyone Merry Christmas. 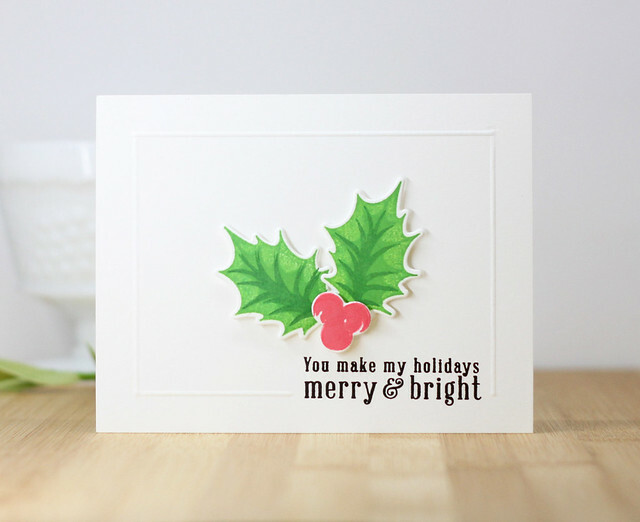 These are such useful dies--you've made them into great cards for the season! Usually I don't like to think about Christmas cards until at least October, but I'm really enjoying seeing these ideas this year. Your cards are a great inspiration to get those cards made early! The gold behind the houses for lights is beautiful. Really brings the town to life. That town die is awesome. Well done. Wow Laurie, simple but elegant! Love these cards! They would be great to mass produce. You added The star, stickles and tree trunk to the tree card, the gold glitter paper to the neighborhood card and the scored frame to the holly berry card;just the right touches to create outstanding cards, TFS. Awesome new HA release! Thanks for the inspiration and fun blog hop! Love the white on gold card the most! That white 3d town is pretty cool!! 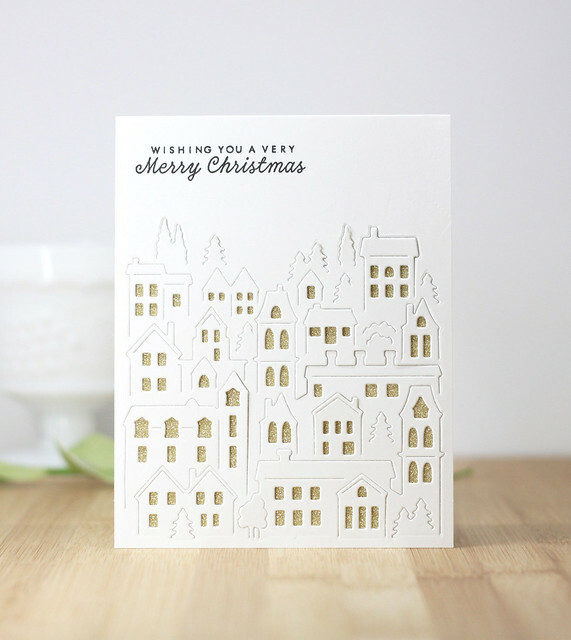 The paper layering neighbourhood looks like a great one and done die for Xmas cards. Then it can be stepped up if desired for house warming, winter and birthday cards if desired. Such awesome new dies... can't wait to get my hands on them! Love the Very Merry Tree and the Paper Layering Neighborhood! Fabulous cards! You've shared three wonderful card. The tree die is spectacular. Thanks for the inspiration.